MindTech International is basically into conducting Multiple Intelligence Test based on Dermatoglyphics technique ( DMIT ). In DMIT Business we are selling DMIT Software, DMIT Mini Software and DMIT Franchise. Premium Plus software with 77 Pages report. The theory of multiple intelligence was proposed by Howard Gardner in 1983 to more accurately define the concept of intelligence and to address the question whether methods which claim to measure intelligence are truly scientific. In his conception , a child who masters multiplication easily is not necessarily more intelligent overall than a child who struggles to do so. The second child may be stronger in an other kin d of intelligence..
Those with strong spatial intelligence are often proficient at solving puzzles. This intelligence is high in artists, photographers, pilots, painters and architects. They tend to learn best by reading, taking notes, listening to lectures, and discussion and debate. This intelligence is high in writers, lawyers, philosophers, journalists, politicians and teachers. The ability to distinguish among an individual’s own feelings, to accurate mental models of themselves, and use them to make decisions about life. The capacity to know one’s self, Careers which suit those with this intelligence include philosophers, psychologists, theologians, writers and scientists. The ability to manipulate numbers, quantities, operations, etc. 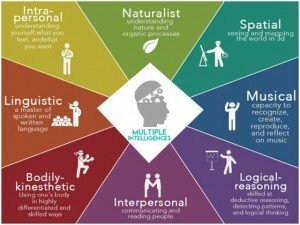 Many scientists, mathematicians, engineers, doctors and economists function in this level of intelligences. Careers which suit those with this intelligence include wild Life Photographer, naturalists, conservationists, gardeners and farmers. Careers which suit those with this intelligence include politicians, managers, teachers, and social workers. Allows individuals to use all or part of one’s body to create products, solve problems, or present ideas and emotions. People who have this intelligence usually enjoy acting or performing, and in general they are good at building and making things. Careers which suit those with this intelligence include athletes, dancers, actors, surgeons, builders and soldiers. The ability to create, communicate, and understand meanings made out of sound, the ability to compose music, to sing, and to keep rhythm & the ability to hear music, tones, and larger musical patterns. Since there is a strong auditory component to this intelligence, they learn best via lecture. They will often use songs or rhythms to learn and memorize information, and may work best with music playing in the background. Careers which suit those with this intelligence include instrumentalists, singers, disc-jockeys, and composers. Let us bring to your kind notice that our work is in progress since 2010. We are active in 20 Indian states with more than 600 successful Business associates established all over India. We are equally active working for international countries like ENGLAND, POLAND, NIGERIA, SOUTH AFRICA, DUBAI, HONG KONG, VIETNAM AND SINGAPORE. Our future progressive development will be in action for New Zealand, Australia, USA, Canada, Zimbabwe and Yemen. There is a higher likelihood of success due to our constant regularly working for this business. We are quite confident that If you follow the system applied by us; your way for an easy running this business shall be very successful with an ease of working. Following are the reasons for why we are being selected for the business of DMIT & Mid-Brain Activation. You can establish your own DMIT Franchise network under your brand name. In real world academic instruction, DMIT Franchise module helps students enhance their own already existing talent sets and prepare for an improved learning experience. DMIT Franchise Module suggests the most practical learning and provides guidance. On several courses that could enhance the student’s natural receptivity. DMIT Franchise significantly assesses the natural acumen and talent of individuals. DMIT Franchise the most feasible learning business opportunity for each and every individual. Mind Tech International’s DMIT franchises module attempts to map the various creative and intellectual processes inside the brain. Mind Tech International’s DMIT franchises several facets and applying studying, reasoning, and decision-making and also creativity. Mind Tech International’s DMIT franchises provide guidance on career choice that will help them become successful in their life. Most of you have indicated your level of financial commitment and taking into consideration the market conditions, we have adjusted our investment requirements. For details of this new exciting offer of DMIT franchise in India. We’re offering a good fit to help expand the DMIT Franchise In India franchise brand. We are offering a worldwide business opportunity to enterprising, enthusiastic and qualified persons to take various educational programs for children from four years old to fourteen and Professional Training programs for adults. In association with other pioneers in DMIT franchise in India as well as international, and follow up DMIT programs, we are looking for dynamic, enthusiastic and committed individuals to bring the benefits of these revolutionary self-development programs to all the children and adults of the world. We provide an ideal DMIT franchise business package in India making it possible for individuals and corporations, who intend to work in the rewarding field of whole mind education with low risk investment, you can own and operate your own DMIT franchise business.